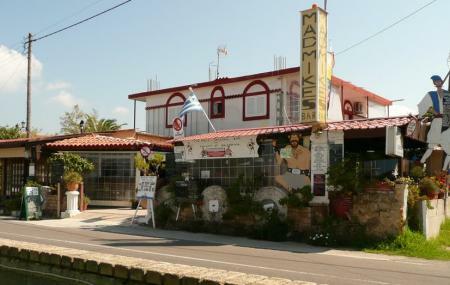 One of the best places to go to if you are looking for entertainment, lip-smacking food and plan on getting tipsy on some of the best cocktails, Mad Mike's Bar is a party like no other in Agios Georgios! Even though, the place is a common breakfast spot, the bar truly shines in the evenings with good live music, a bar to keep those drinks coming and a crowd which is high on the party mood. How popular is Mad Mike's Bar? People normally club together Corfu Boat Hire and Breakout Game Centre while planning their visit to Mad Mike's Bar. People also prefer to end their day with Mad Mike's Bar. Great bar and restaurant with a lively atmosphere. Great for breakfast or evening meal and live band on during the week. A great place. Breakfast is very good value. Great atmosphere on music nights. And lovely home cooked food. And Mike is a bit mad.😊😋in a good way. Mad mikes is awesome. I have been to St. George’s twice. Once with a mate and another with my wife and each time we came to mad mikes every morning for breakfast. Simply because it’s the best place I’ve ever had breakfast in all of Greece (I’ve been visiting greece for 13 years) and it’s the best I’ve had. It’s hard to find a nice breakfast just like you want but mad mikes have a great variety on the menu and it all tastes lovely. If it’s not on the menu what you want, they will cater for your needs. Secondly the owner Elias and his wife Sharon are the nicest people you will ever meet and Elias is one of the funniest blokes I have ever met. It’s not just breakfast that is decent. They have a live band on every Tuesday and Friday evening at 10pm who perform a good variety of different tunes and they sound great. The guitarist is unbelievable. I hope this review sways you to go and try madmikes. We have left every time with our bellies full and a big smile on our faces.